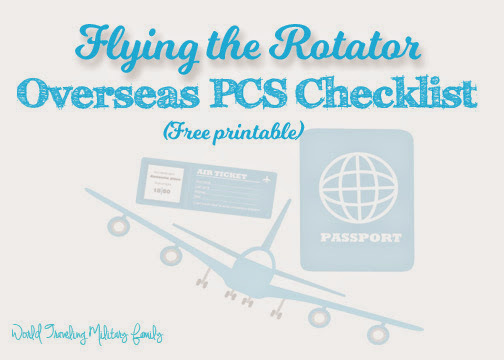 I’ve made a Flying the Rotator Overseas PSC Checklist for those of you doing an Overseas PCS. As I’ve been helping many families during their Overseas PCS I’ve found that not everyone is able to easily get information. I’ve been told by several people that they were not told by their leaving base that they all needed current military ID’s and several families arrived with their kids having expired ones and were almost not let onto the flight, so here is a list to make sure that doesn’t happen to you! Get tickets (with hard copy orders, this can be done 75-90 days out if you have everything completed), you’ll to reserve them but won’t be able to pick them up until a week before the flight. Pick up your hard copy tickets from the Travel Office a week prior to flying, add this to your calendar the day you book the tickets. Make sure you have No-Fee Passports, Civilian Passports, & Military ID’s and make sure that none of these items are expired! Passports should also not be expiring for at least 6 months. Luggage – 2 bags per person allowed & a carry on. Bags can be up to 70 lbs each if needed. Snacks in your carry-on, sometimes ‘breakfast’ is something like unappealing hamburgers so have food in case you get hungry. You’ll have to wait to get drinks from the vending machines after you get through security. Verify Check-in time, it is normally hours prior to boarding, try to check in early if you can. (side seats are 3 per row, while middle seats are 4 in a row) We went to check in shortly after it first opened and then headed back to the hotel to wait until it was time to go through security. This was great because when we came back there was a HUGE line of people waiting to check in that we did not have to wait in. They weigh everyone (including pets) and all your baggage including carry-ons. Then you will get your boarding passes. Wait to go through security. 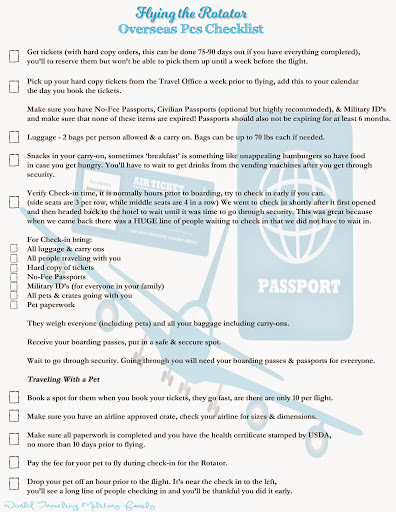 If you’ve reserved a hotel or a 2nd night you can return to hotel to wait until time to board, we did that you can read about it HERE. If not you can hang out in the USO so you don’t have to go through security just yet. If you have pets you will be unable to bring them in the USO which is why I recommend reserving a hotel room even though you won’t be staying all night. If you do go to a hotel head back to BWI about an 1.5 hours prior to boarding. Go Through Security, give yourself at least 30-45 minutes. After going through security buy some drinks to take on the plane, find the seating area. Board the flight and your on your way! Book a spot for them when you book your tickets, they go fast, are there are only 10 per flight. Make sure you have an airline approved crate, check your airline for sizes & dimensions. Make sure all paperwork is completed and you have the health certificate stamped by USDA, no more than 10 days prior to flying. If you are traveling with a pet you’ll pay the fee during check-in for them to fly on the Rotator. If you have a pet you can drop them off an hour prior to the flight. It’s near the check in to the left, you’ll see a long line of people checking in and you’ll be thankful you did it early. I hope this is helpful to those flying the Rotator, especially those who may be doing so for the first time 🙂 Any other tips for those who are flying the Rotator? Are pets able to fly in the rotator cabin if they are under a certain weight or size? We are PCSing to Germany and are veryyy nervous about getting our little Shih-Tzu there! Pets can fly in the cabin IF they have been booked on your flight and reserved a spot. There are only so many spots per flight in the cabin and cargo so I highly suggest you book your flight as soon as you get your orders.